Please refer to our stock # 1730 when inquiring. All metal is sterling silver. 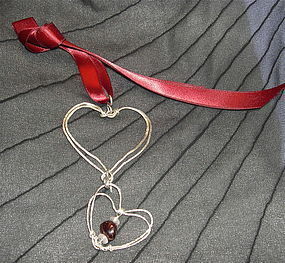 In a USA studio this original design of two silver hearts were hand hammered wrought and shaped into a double valentine each by and signed with the metal work maker's mark of: Handmade Sterling Mimi Dee. The lover's stones of garnet and rose quartz were added to the smaller of the two. Legal: All images design concept content text solely owned by Mimi Dee. Wt 20 grams, ~17 -18 grams are sterling. Top Bigger Heart: 3" X 2 5/8" of 14 guage sterling; the hook has been replaced by a handwrought 2 3/4" bail to allow omega, ribbon, cord, etc. 12mm red garnet & two 7mm faceted rose quartz. $15 USPS Priority/Ins/Track or free with USA Ck or USPS MO. This signed studio metalwork artist who also paints oils / acrylics has made fiber art to wear garments in the past and does not duplicate, has exhibited in various juried art shows, more recently since the 90s to present.